Renaissance Tower is located at 1201 Elm Street in Dallas, TX and was completed in 1974. This building was designed by Hellmuth, Obata and Kassabaum and stands 886 feet tall with 56 floors. Renaissance Tower was originally 710 feet tall (without its towers) and the tallest skyscraper in Dallas until the completion of Fountain Place. This pewter replica stands just over 6-1/4 inches tall and is finished in antique pewter. This model's scale is 1 inch = 150 feet. 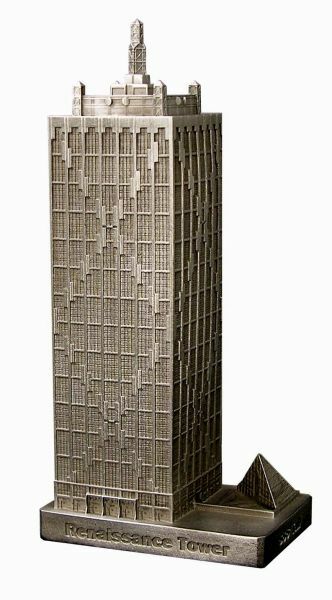 This is a great model and though I now live with a view to downtown Dallas, it's not clear how big the dimensions of this building are until you see it to scale with your other 1-150 buildings. Great job!